The grounds of ROAM this time of year are in full bloom. A certain type of frenetic energy abounds; the excitement is almost palpable this sunny May morning. It could be the upcoming bus ride that everyone has been anticipating for the last three hours or the chicken potpies being served for lunch. But much more likely..It’s the sweet smell of grass (lining the sidewalk) and happy faced pansy’s, tucked neatly into their new little beds, which is causing the surge of excitement on this little dementia floor. The faux plants in the Lobby of Happy Daze Assisted Living have been replaced with..More faux plants. Real looking enough to fool even the most observant of elderly eyes. 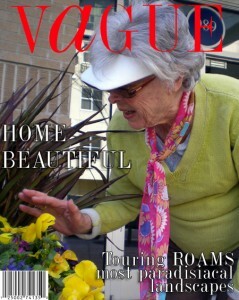 The birds (and hearing aides) are whistling their merry tunes and our supermodel Ruth is ready for her workday to begin. VAGUE surveys the on-duty style of the woman who makes her HOME beautiful and everything around it grow and sparkle. • Don’t over water them. Just, whenever you remember..throw a cup of whatever you’re drinking on them. • Talk to them regularly. I always have a nice conversation. • Don’t let any slugs get to them. For this..you might need to come out in your nightie at night and creep up on the slugs and pull them off. I’m up every night and I try to come down. I wake up all my friends to go with me. I start to go towards the door and then I hear a noise and turn around.. and there are ALL these people behind me. We forget what we were doing and go back to bed. Gardening Sports Visor-Women’s Active Dept. Nordstrom ($18) Sunglasses-Transitional Lenses Lens Crafter, Floral Scarf-ROSS Dress for Less $10 (I think it was more like $8) and Loehmans Vintage (1982) Knit Sweater 75% off. Hair, Miss Zi for Bumbled and Bumbled; makeup, Ruth and DIL (daughter-in-law, Mother Plucker). Set design, City of ROAM, USA. Shot across the street of Happy Daze. If you live on a Dementia Floor and have some home beautification tips to share please send them to VAGUE.